The world’s favourite series is here and it is heating up as the end draws near. FreshMenu is celebrating this with our Terrific Tuesday surprises with an exciting “Game of Treats” menu that’s sure to thrill your taste buds too. As grand and mysteriously dark as the Red Wedding, this indulgent mousse cake is sure to leave you with a desire for more. Soft strawberry mousse is packed in swirls of fluffy strawberry Swiss rolls unravelling with each bite. A taste the North will always remember! With almost everyone joining the White Walkers' Army, we thought it'd be great to have a whole club sandwich dedicated to them. Here's a creamy sandwich that's sure to make any vicious beast turn into the warmest soul. Feast on a nice bite of roasted boneless chicken and mushroom duxelles mixed with creamy cheese dressing, sandwiched in a triple decker club with cheddar cheese slice and slaw. Get a thrill out of every bite! The Hound sure does love his chicken, especially if there is a "talker" near by. This Mexican-inspired burger is a treat to the Sandor Clegane in you. 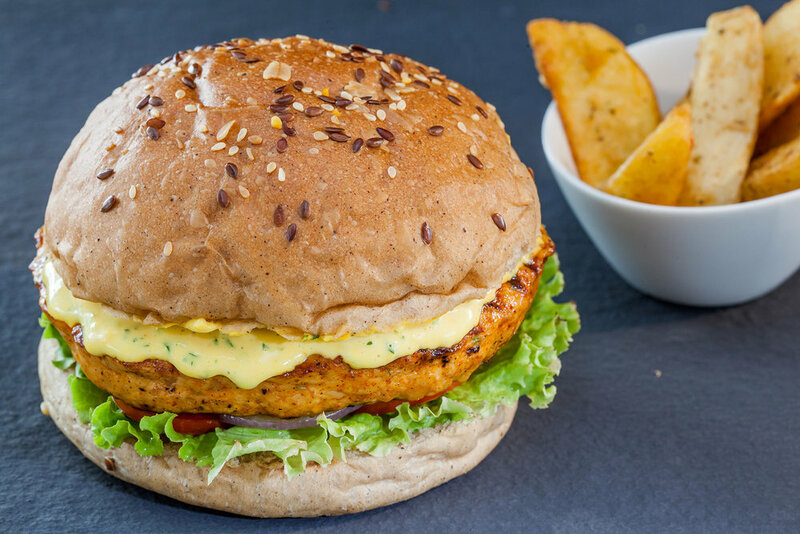 Chipotle spiced chicken mince patty is char grilled to perfection. Layered with onions, tomatoes and topped with cheese chilli spread. This comes with an addition of potato wedges and Chill'd Beverage to fill up the extra appetite. A perfect mixture of warm and spicy, like our very own, Mother of Dragons, Daenerys. The secret of this recipe is the chicken, slow cooked in rich broth with ginger tomato and some irresistible spices. Every slurp is filled with warmth and desire. A little something that Jon Snow would munch on while he stood guard at the Wall, in the cold and dark, next to the fire place. This crunchy, creamy chicken popcorn is a must have! Morsels of boneless chicken are marinated in ghost chili (What do you think his direwolf was named after?) and crispy golden fried. Laden with spicy tomato salsa, these popcorns are then loaded with cheddar cheese sauce to give it an ultimate finish. Breathe in the warmth of Drogon's fire as this delicious dish tingles your senses with it's tempting aroma. Succulent grilled chicken fills your taste buds with umami as the bell peppers and herb pilaf crunch with the steakhouse secret sauce oozing like warm lava! Served with butter sauteed veggies. Feel as magical as a dragon! Come over to FreshMenu and make your Tuesday a terrific one with our delicious treats to go with your favourite series fever. Send us some love by liking us on Facebook and tagging us on Instagram. We’d love to hear from you. Valar Devouris - All Men Must Eat! 8 Italian Dishes You Must Try! Here’s How To Have The Coolest Party, FreshMenu Style! Happy World Emoji Day - Let's Eat!